(Hali Bernstein Saylor/Boulder City Review) Enough snow has fallen on the Colorado Rockies this winter to stave off a federal shortage on the drought-stricken Colorado River. The shortage would be triggered if water in Lake Mead fell about 15 feet below its current level. Enough snow has piled up in the mountains that feed the river to stave off a dreaded shortage declaration for one more year, according to federal projections released Friday, March 15, afternoon. Just a month ago, forecasters expected Lake Mead to start 2020 about 17 feet lower than it is now, below the trigger point for a first-ever federal shortage declaration on the drought-stricken river. But several weeks of winter storms across the Mountain States have cut the lake’s expected decline by Jan. 1 roughly in half, leaving the reservoir safely above the shortage line, according to the new figures from the U.S. Bureau of Reclamation. And the promising percentages are expected to climb. Even before the recent storms, federal forecasters had significantly upgraded their outlook for the Colorado. In January, they were predicting another dry year, with just 64 percent of the average flow during the river’s peak April-through-July snowmelt period. By mid-February, that runoff forecast had increased to 74 percent. It hit 102 percent in the Bureau of Reclamation’s latest batch of monthly projections, and Miller said it could climb as high as 130 percent a month from now. If the latest forecast holds, it would mark just the sixth year of above-average flows since 2000 for the river system that supplies 90 percent of the Las Vegas Valley’s drinking water. Federal regulators will declare the first-ever shortage on the Colorado if the water level in Lake Mead starts the year at less than 1,075 feet above sea level, roughly 15 feet lower than it is now. That would force Nevada and Arizona to reduce their river use by 4 percent and 11 percent, respectively. As recently as February, such a shortage declaration seemed almost guaranteed. Now that seems unlikely. Miller said there is two to three times more snow on the ground than there was a year ago throughout much of the Colorado River Basin, though not all of that accumulation will translate into water for the river and its tributaries. He said some of the above-average moisture will be absorbed by high-country soil left parched by 20 years of record drought. If there is enough left over to boost the level of Lake Powell and send more water downstream to Lake Mead, the river could skirt shortage once again. 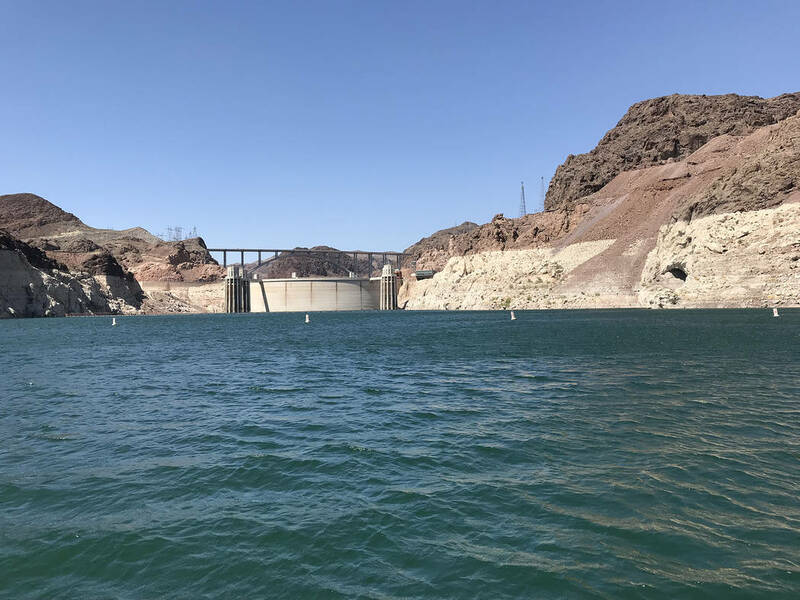 Water managers will know for sure in August, when Reclamation officials issue their river operations plan for the coming year and decide whether to impose the mandatory shortage cuts based on the projected Jan. 1 water level in Lake Mead. In the meantime, the seven Western states that share the Colorado finished an emergency drought plan that outlines voluntary water deductions — on top of the mandatory ones — by Nevada and others through 2026 just ahead of a federal deadline. However, the deal signed Tuesday, March 19, in Arizona excludes the river’s largest water user. California will participate in the plan without the Imperial Irrigation District, which draws more water from the river than any other entity but is refusing to sign the pact because it doesn’t address the growing environmental threat posed by the shrinking Salton Sea. Southern Nevada Water Authority chief John Entsminger and other representatives from the seven states gathered in Phoenix to sign a letter to Congress requesting federal legislation enacting the so-called Drought Contingency Plans negotiated by the states over the past four years. In a written statement, the water authority said the commitments made by water users will help preserve the health of the river system and protect water supplies across the basin. “With nearly two decades of severe drought conditions on the Colorado River and continuing uncertainty associated with climate change, the critical importance of the (Drought Contingency Plans) cannot be understated,” the statement said. “I commend the basin states and key water contractors on the completion of this historic milestone,” she said. Regardless of how wet this winter turns out to be, the voluntary cuts are expected to kick in early next year. The plans call for Nevada, Arizona and, eventually, California to voluntarily reduce river use and leave more water in Lake Mead, while Colorado, New Mexico, Utah and Wyoming send more water downstream to prop up Lake Powell and protect hydro-power generation at Glen Canyon Dam. Under the first round of annual reductions, which could start in January, Arizona would give up 192,000 acre-feet of water and Nevada would give up 8,000 acre-feet, enough to supply about 16,000 average valley homes for just over a year. California would join in the voluntary cuts only if Lake Mead’s water level drops another 45 feet from where it is now.